The Mziki chalets are situated on a hillside with a view over the Jozini Dam. 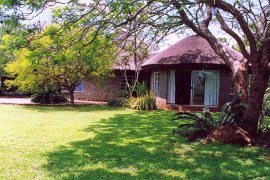 We have affordable accommodation perfect for fishing and hunting trips in the Jozini area. We have a fully equipped kitchen complete with freezer, stove, microwave oven and all cutlery and crockery. A large braai boma is perfect for evening around the campfire and our swimming pool is essential on hot summer days after a long day on the Jozini dam. Affordable prices for South Africans. The following lodges are perfect for Pongola hunting and Jozini Tiger fishing trips. 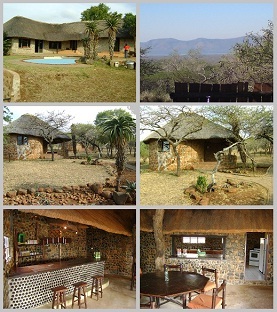 Fully serviced self catering lodge set in the bushveld 8km from the Jozini Dam. Fully equipped kitchen and braai lapa. 2 Lodge rooms and 3 neat chalets. View over the Jozini Dam and Lebombo Mountains. Affordable but very comfortable Lodge. Luxury lodge accommodation close to Jozini Dam. Tiger fishing charters from the lodge. Self Catering chalets B&B and DB&B. Swimming pool in the lodge. Situated in a wildlife reserve. 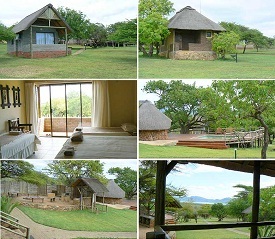 Tented self catering lodge and chalets. Slipway and boat mooring area. Near to good tiger fishing spots. Very affordable for larger groups. Jozini Lodges and bush lodges are situated perfectly for game viewing and birdwatching. 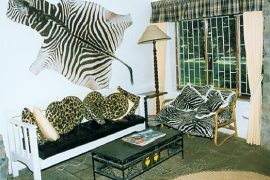 Jozini Lodges near Jozini Dam, are situated on a private game reserves in the heart of Zululand, KwaZulu-Natal. Some Jozini lodges are located within the Zululand Rhino Reserve, which is 23 000 ha, and a short drive from Jozini Dam and Mkuze, making it an ideal halfway stop-over for guests traveling between Kruger park, Swaziland and Mozambique from either Johannesburg and Durban and. The Jozini lodges are also a perfect base from which to explore Lake Jozini, the Jozini gorge and the Mkuze Game Reserve. Jozini Lodges offer catered, or self-catering lodge accommodation in different lodge units as well as true "out of Africa" experience in well equipped bush lodges where camping is also available. One is assured of a warm welcome by the staff upon arrival at the Jozini Lodges and their personal attention and passion in sharing their knowledge and experiences with young and old alike. It is a privilege for them to share their paradise with everyone who comes to visit the Jozini Lodges and to ensure that a visit to Jozini lodges will definitely be an unforgettable experience and memory. Jozini Lodges are the perfect base for a Jozini tiger fishing trip, a Jozini birding trip or simply to spend some time in the African outdoors.